Dilmah Founder and MJF Foundation Settlor Merrill J. Fernando last week declared open the 71st MJF Foundation supported Child Development Centre (CDC) in the Easdale Division of Somerset Estate. The MJF Foundation renovated or constructed CDCs currently care for upto 3,500 estate children below the age of 5. These children are provided with a nourishing meal each day as part of a programme to offer them a caring and stimulating environment in which to learn and develop while their parents are at work. 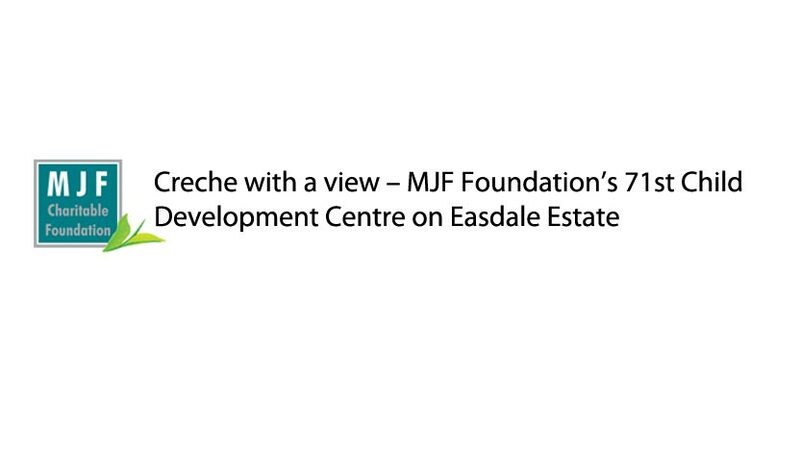 Traditionally estate crèches were of basic standard and the MJF Foundation CDC on Easdale sets a new standard with a spacious layout and high standard of equipment. Each centre is provided with materials and facilities for learning and play to create a balanced and safe environment to nurture young minds. Hailed by workers and industry personnel at the event as the ‘first of its kind in the plantations,’ the 71st MJF Foundation Child Development Centre was ceremonially declared open on 26th June 2008. The centre is constructed in a picturesque setting amidst the lush green tea fields of Somerset Estate, close to Nuwara Eliya. This modern facility is equipped to provide its young beneficiaries effective learning and social development. The crèche includes audio visual equipment for advanced development, a novel feature for such an establishment. Settlor of the Foundation Merrill J. Fernando together with his son Dilhan, were greeted on their arrival by an exuberant and happy community. Also present were a team of Australians, including Peter Kuruwita whose Flying Fish Restaurant in Sydney, partnered with the Foundation in assisting the Maha Ara school in Hambantota. Speaking on behalf of the Talawakelle Plantations, veteran planter Theja Dharmaratne expressed his sincere gratitude to the Settlor and his Foundation for the effort in uplifting the lives of the tea estate community. Apart from the Child development Centres the Foundation projects for nurturing estate children include developing and equipping primary schools, a nutritional improvement programme for infants and children, providing primary school entrants school kits complete with books and educational material and supporting estate children preparing for their GCE Ordinary Level examination classes in English and Mathematics and providing their schools with IT facilities to enhance the quality and effectiveness of their education. 63 Advanced Level and 31 University students are provided Foundation educational scholarships. Also addressing the gathering was a tea plucker from the community who made a heartfelt appreciation speech on behalf of the estate workers. She expressed gratitude to the Foundation for their efforts in improving their lives and those of their children. Through the assistance they receive from the Foundation the community has been able to gain access to health facilities, nutritional supplements and education for their families. A highlight of the ceremony was young Balakrishnan Sathyaraj, the son of a plantation worker. Balakrishnan received Foundation sponsorship for his education and has become the first child of a plantation worker to gain entrance to the prestigious Medical Faculty at the Rajarata University. Speaking at the ceremony Balakrishnan brought tears to the eyes of many in the gathering when he explained the difficult circumstances from which he has lifted himself with the aid of the MJF Foundation. As a son of a plantation worker, Balakrishnan explained he would have not had the financial resources available for him to complete his education and thus the scholarship he received from the Foundation has paved the way to achieve a huge milestone for him and his community. The Foundation will continue to support the education of estate children by replicating the model Child Development Centre at Somerset in other estates and enhancing the educational programmes for secondary and tertiary students. The Foundation also made a commitment to build a new primary school at Somerset Estate. Speaking at the ceremony Settlor of the Foundation, Merrill J. Fernando spoke of his vision to give back to the community that has done so much for a great industry. He emphasised his commitment to uplift the living standards of the community and to ensure that through his Foundation they and their children are provided the means for a brighter future.